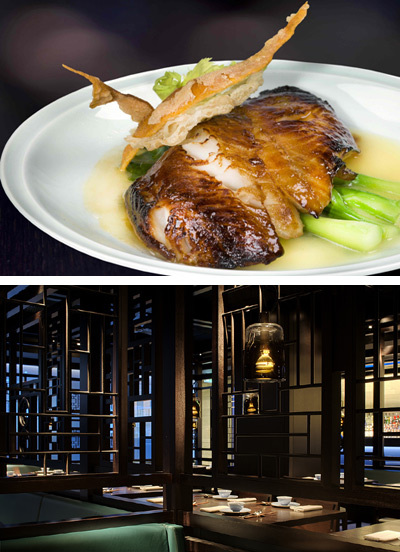 Opened by legendary restaurateur Alan Yau in 2001, the original Hakkasan has gone on to be one of the most fashionable and successful restaurant brands in the world. However, perhaps to the concern of serious foodies, an Abu Dhabi investment group took over from Yau in 2008 with the aim of expanding the concept. So here we are in über-posh Mayfair at London’s second Hakkasan and we can happily confirm that this new restaurant is every bit as impressive as the original. This is no doubt because the kitchen is overseen by Executive Head Chef Tong Chee Hwee who, as the culinary talent responsible for Hakkasan’s menu since the very beginning, has built on the signature repertoire featured at the original. This menu has been supplemented by some exquisite new dishes, including Steamed New Zealand mini Lobster, Black Truffle roast Duck and Sliced blue Abalone in Hakka sauce. The menu also features what is one of London’s most decadent dishes in the form of lollipop shaped Sesame prawn toast that comes filled with melting foie gras. However, it’s not all about luxury dishes, as even simple things like dim sum are also expertly executed. To top an exceptional meal, Hakkasan even manages to smash our golden rule of avoiding desserts at Oriental restaurants by delivering a range of sweet dishes that are match for anywhere in London; both the delicately spiced Cardamon crème brulee and a Chocolate soufflé had us both stunned into a moment of silence to fully appreciate their utter loveliness. The design also successfully keeps to the effortless style of the often imitated never duplicated original, with an extensive use of dark woods, luxurious marble and moody lighting. Set over two floors, guests have the option of the full dining experience in the large basement restaurant or some excellent cocktails and a quick bite in the lounge bar on the ground floor. As you would expect of a restaurant of this calibre, this is somewhere strictly for special occasions and generous expense accounts. However, the great food and special experience will leave you in no doubt that it’s worth every penny.